Now, the Olympian finds strength in what makes him different. 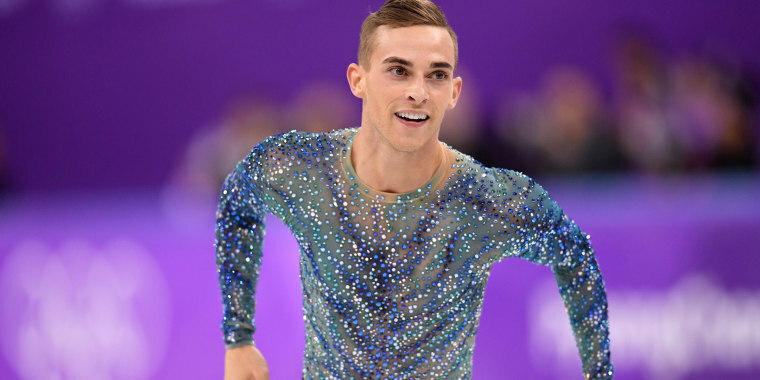 Adam Rippon is one of our 2018 TODAY Style Heroes. Click here to see the full list! In an essay for TODAY Style, the Olympic figure skater talks about the pressure put on athletes to look a certain way how he learned to embrace his differences after combating an eating disorder. Rippon, 28, spoke to us on behalf of his work with DSW and their latest campaign, which is all about inspiring self-expression. In sports, we sometimes have a skewed vision of what we should look like. Even just being out of skating for a few months now, I see it more. What I thought was so normal is so abnormal. For a long time, I struggled with what I thought would be the best version of myself. Not that I didn’t like the way I looked, but I wanted to be the best skater I could be instead of just trying to be the best athlete I could be. When I focused on being the best athlete, my body changed. It didn’t look like everyone else’s, but I was skating my best. I was healthier. It’s really about staying true to being healthy but also remembering we’re all different. Everybody’s “healthy” and everybody’s “perfect body” are going to look a little bit different, and that’s OK. That’s right. Self-expression is the ability to take what you feel on the inside and show that to the world. You can express yourself through words, actions and through your style. Every chance you have and every opportunity you have to express yourself, you should take advantage of it. I think I represent people who have felt different at some point in their lives, which we all have. That’s what life is all about: sharing who you are and learning about other people. It’s about being brave, and sometimes your clothes or style can act like your suit of armor going into a situation. It gives you the power to do something. It can change your mood. Being in a pair of sweatpants can make you feel comfortable and being in something high-end can make you feel pretty fancy. Style has a huge effect on the way you feel about yourself. If I had a chance to talk to my younger self, I would say: Don't be afraid to be different. Don't be afraid to make mistakes. I’ve learned the most from the mistakes I’ve made. I’ve learned being different is what makes me really special. We’re all a little different. We all sometimes struggle with the fear of not being perfect or letting other people down. So, little Adam, let go of that fear and just be unafraid. Everyone says, “When one door closes, another one opens,” and I love that quote but you have to look for those open doors. It can feel like all the doors are closed, but sometimes you just need to look around. You don’t know what other possibilities are out there. Even if you have setbacks or if something doesn’t feel like it’s going in the right direction, maybe it's just leading you to a better direction. The response from the LGBTQ community on my Olympic journey has been pretty overwhelming but incredible. I don’t think I was expecting to hear from so many people of different ages and backgrounds. I think I represent people who have felt different at some point in their lives, which we all have. We’ve all gone through hard times. I’m just really grateful I had the chance to go to the Olympics and represent my country, but more than that, represent myself really authentically. I didn’t realize how many people still struggle to be able to do that, so I hope seeing Mirai (Nagasu) and I compete at the Olympics — two people who four years ago were crying together on a rooftop eating In-N-Out because we weren't at the games — helps people realize you can achieve anything you dream of. What I value most about my friendship with Mirai is that she’s somebody I can always rely on; somebody I can say anything to without any sort of judgement. I'm able to speak my mind and say things that are really bothering me and I know I'm talking to someone who I can trust. As I get older, I see how rare and lucky I am to have a friend like her. I want people to know that you can be anybody — you can be a girl from Arcadia, California, like Mirai, or a boy from a small town in Scranton, Pennsylvania, like me — and achieve your dreams. Really anything is possible if you set your mind to it.